By author: Richard E. Rankin Jr. 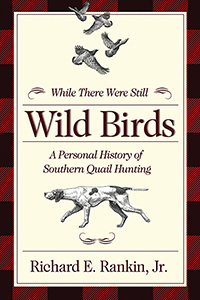 WHILE THERE WERE STILL WILD BIRDS is a personal history of Southern quail hunting as it was lived at three different South Carolina quail hunting clubs and by related dog trainers, hunting guides, and hunters. The author's father, Richard E. Rankin, Sr., belonged to the first hunting club in Kline, South Carolina, and was a founding partner in the second hunting club, the Quail Roost Hunt Club, outside Manning, South Carolina. The third club featured was the Foreston Hunt Club, an adjoining neighbor of the Quail Roost Hunt Club. As both a family member, hunt club partner, and historian, Richard E. Rankin, Jr. tells this story as both a participant and as an objective observer. This study covers a span of time from the mid 1930s--when Southern quail hunting was still a popular and important field sport--through and after the mid 1980s when the massive collapse of the quail population ended wild bird hunting. The book explores the character and meaning of Southern quail hunting in a particular setting. It emphasizes the importance of hunting fellowship (especially between the author, his friends, father, and other hunting associates) and the way in which bird hunting leads to a dramatic encounter with wildness. Because Southern quail hunting was part of the larger culture, the book also discusses how race, gender, and environmental change impacted Southern quail hunting.